The US envoy for North Korea will meet his South Korean counterpart in Seoul on Saturday for a briefing on the results of his visit to the communist state for preparations for a second summit between Washington and Pyongyang slated for late this month. 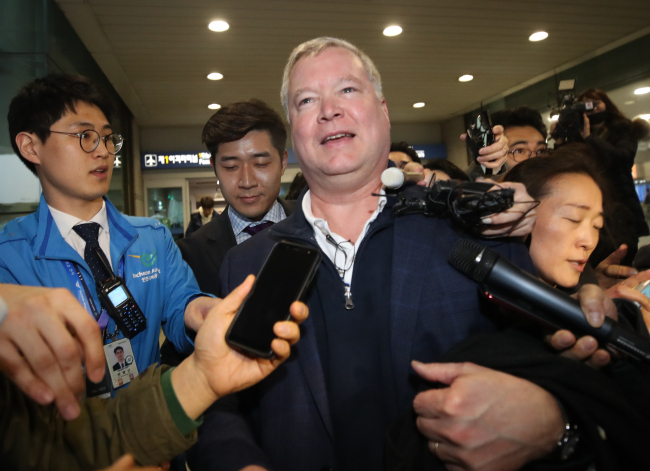 US Special Representative for North Korea Stephen Biegun plans to hold talks with Lee Do-hoon, Seoul's top nuclear envoy, in the morning after paying a brief courtesy call on Foreign Minister Kang Kyung-wha. Biegun flew back to Seoul on Friday night after wrapping up a three-day visit aimed at fine-tuning details, including the agenda and logistics, for the summit between US. President Donald Trump and North Korean leader Kim Jong-un set to take place in the Vietnamese capital of Hanoi from Feb. 27-28. In Pyongyang, he met his North Korean counterpart Kim Hyok-chol, a former ambassador to Spain, with an aim to make progress toward the "complete denuclearization" of the Korean peninsula that their leaders agreed to in their first historic summit in Singapore in July. Under the vision of "final, fully" verified denuclearization, Washington has been pressuring Pyongyang to take concrete, substantive steps for its nuclear disarmament, including a declaration of its nuclear and missile programs. The North has demanded the United States' corresponding measures for its denuclearization steps that may include partial sanctions relief, the establishment of a bilateral liaison office and a declaration of a formal end to the 1950-53 Korean War.